Welcome to our recipe page. Here you’ll find recipes and design ideas that can be completed with relative ease, even if it’s your very first time. Bake the desired cake mix in a two piece cupcake cake mould (found in all good baking shops). Allow cakes to cool. Knead 700g of Orchard’s Ready to Roll White Icing as directed on the back of the pack and roll out to the thickness of a pencil. Brush Sugar Syrup* onto ‘cupcake top’. Drape icing over the cake and smooth down over all areas. Trim icing in a wave like finish, leaving excess length. Knead a further 200g of Orchard White Icing, adding a few drops of red food colouring (NB: adding sifted icing sugar prevents stickiness). Knead icing for a second time to mix in colour and roll out to a 3mm thickness. Cut a round, wavy shape from the icing, apply Sugar Syrup and drape over the cupcake top to create the pink frosting layer. 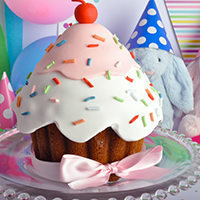 To attach the cupcake top to its base, apply your favourite frosting and use as an adhesive. Cupcake sprinkles and cherry were created by colouring a small piece of leftover icing and attaching with Sugar Syrup. We used 1kg of icing. Sugar Syrup: dissolve 2 parts sugar and 1 part water and bring to boil. Use while warm. 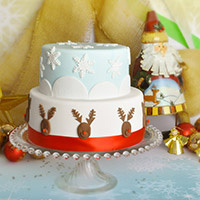 Bake desired cake mix (we suggest a delicious Christmas Fruit Cake) in small and medium round cake tins. Allow to cool. Firstly layer the cakes with 2kg of Orchard’s Ready to Roll Almond Icing. This gives a great flavour dimension for a fruit cake and allows for a smoother finish. Knead and roll out as directed on the back of the pack. Brush both cakes with Sugar Syrup* and drape the icing over the cakes, smoothing out and trimming any excess icing with a sharp knife. Next, knead 2kg of Orchard’s Ready to Roll White Icing as directed on the back of the pack and roll out to a thickness of a pencil. Apply Sugar Syrup* to the medium sized cake (this will be the base tier) and drape the White Icing over. Again, smoothing down the sides and trimming the excess. With the remainder of the icing, add a few drops of blue food colouring and roughly knead (not completely mixing the colouring in to achieve the marble effect). Apply Sugar Syrup to the small sized cake (the top tier) and drape the blue icing over. Knead a further 250g of Orchard’s White Icing and roll out to a 2mm thickness. Snowflakes were cut out with cookie cutters and applied with Sugar Syrup. The Reindeer heads can be created with 250g of Orchard’s Ready to Roll Chocolate Icing (available in some cake decorating stores) or, alternatively, colouring Orchard’s Ready to Roll White Icing. The antlers can be made using the snowflake cookie cutters, cut into 6 separate antlers. These can then be attached to the reindeer heads cut from oval shaped cookie cutters. Apply these with Sugar Syrup and allow to set. We used 4.5kg of icing.